Book News: Lance Armstrong's Lies Are Protected, Judge Says : The Two-Way Also: Annie Proulx wrote the libretto for an opera based on "Brokeback Mountain"; Jesmyn Ward on losing her brother; Isabel Allende recalls Pablo Neruda's funeral. 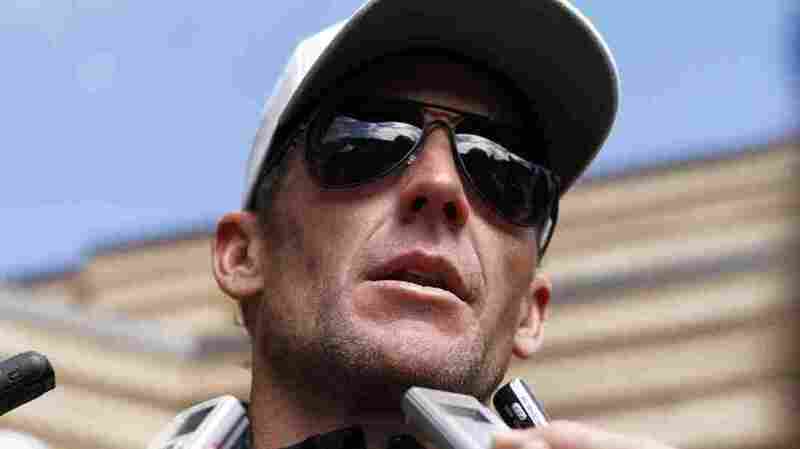 Lance Armstrong talks to the media after the 2011 Xterra Nationals triathlon in Utah. A federal judge has ruled that Lance Armstrong, the disgraced cyclist who admitted to doping earlier this year, is allowed to lie in his memoirs. Earlier this year, a group of readers in California sued Armstrong for fraud and false advertising, saying they would not have bought his books It's Not About The Bike and Every Second Counts had they known his claims about doping were false. On Tuesday, U.S. District Judge Morrison England issued a 39-page ruling in favor of Armstrong and his publishers that stated, "The content of the Armstrong books is not an advertisement for a product; rather, the statements are Armstrong's account, albeit partially untruthful, of his life and cycling career." It added that "the content of the books is afforded full First Amendment protection." Annie Proulx wrote the libretto for a new opera based on her short story "Brokeback Mountain," which will premiere this winter at the Teatro Real in Madrid. The opera's composer, Charles Wuorinen, said in a statement, "When to my great joy Annie Proulx agreed to write the libretto herself for my proposed opera, I told her that my mission would be to restore the meaning of a story that may have become world famous, but (as happens so often) has been hidden in the process." In an excerpt from her memoir, Jesmyn Ward writes about her brother, who was killed by a drunk driver: " 'You still want your oil changed?' my father asked. Years later, this ordinary memory gains heft, representative of all the ordinary days we shared, all the ordinary days we lost. It generates so much heat, it makes my fingers ache like a phantom limb as I imagine my brother alive and close enough to touch, how he would be warm on that cold day: the keloids of his scars, his scalp the color of butter." In an interview with Amnesty International about the Sept. 11, 1973, military coup in Chile, author Isabel Allende recalls the funeral of Chilean poet Pablo Neruda: "That day we buried not only the poet, we buried [President Salvador] Allende, [folk singer Victor] Jara, and hundreds of other victims, we buried our democracy, and we buried freedom." For The New Yorker, Reed Johnson explores why J.D. Salinger's Catcher in the Rye is so popular in Russia: "For a postwar intelligentsia chafing under repressive Communist rule, Holden Caulfield's voice was electrifying — who knew phony better than these daily consumers of official Soviet language?"